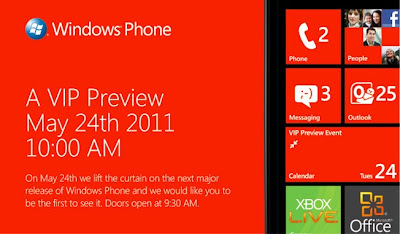 BGR.com is reporting that Microsoft will be holding a VIP media event on May 24 to talk about what's coming for the next release of their Windows Phone smartphone operating system. "We know Mango will offer Internet Explorer 9 with an integrated Twitter experience, better multitasking, and new apps such as Angry Birds, Skype, and Spotify. We’ve also heard that Microsoft will add Bing Audio for identifying music, Bing Vision for scanning bar codes, and voice-guided turn-by-turn navigation with Bing Maps, although none of these features have been confirmed by Microsoft just yet." Sounds interesting. The timing is also interesting to me because Microsoft will be holding their event just days before Apple's World Wide Developer's Conference, at which, they will be talking about the future of the iOS platform, Mac OS X, and hopefully, new cloud based services. By the way, over the weekend, I saw that the B&N Nook now supports apps, including the insanely popular Angry Birds game. Is there any platform out there that Rovio hasn't invaded yet?